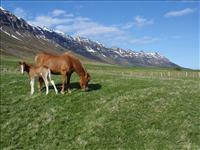 Skorrahestar offers unique horse riding tours in East Iceland. 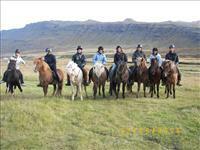 Ride up and over the steep mountains, along the lush green valleys and race across the sandy beaches on well trained Icelandic horses. 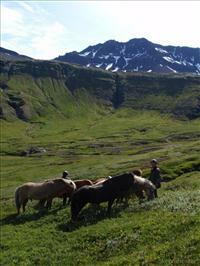 The deserted fjords and the folklore of the area comes alive through storytelling with an experienced farmer/teacher as your guide. You get to experience our homemade international cuisine with a touch of Icelandic tradition as you become a member of the Skorrahestar family. You arrive as a visitor but you leave as a friend!